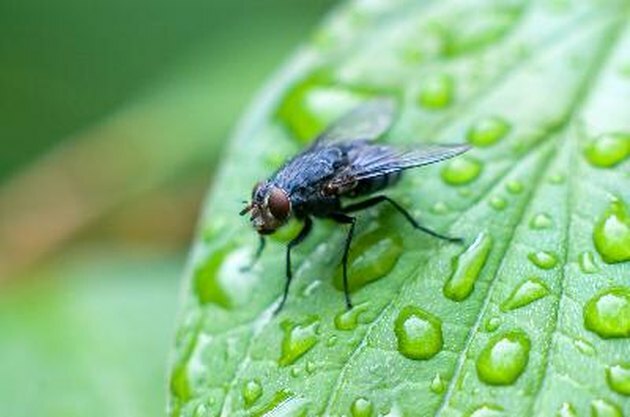 Black flies are nuisances that can invade the home and your landscape, making indoor and outdoor areas of the home less enjoyable. The flies seem to multiply quickly and often attack food and buzz around your family members and pets. A few natural repellents will help to keep the flies away. Many bug sprays are full of chemical ingredients that will repel or kill the flies, but they also leave behind harmful residue and vapors that can harm your family and pets. In reality these are not necessary sprays when you are searching for something that simply keeps the flies away from your home. Mint gives off a strong smell that works as a repellent for black flies. You can use mint and peppermint in several ways. One option is to fill sachets with crushed peppermint or mint leaves and place around the home. These work especially well when placed in eating areas and around food dishes for pets. You can also sprinkle mint or peppermint essential oil around the home; it's harmless but highly effective in repelling flies. Again, sprinkle around eating areas, pet food areas and around window and door entries to the home. Basil and clover are also effective fly repellents and can either be placed in sachets or placed around the home in open sandwich bags or bowls. Again, place in eating areas and around entryways to the home. Some types of black flies bite, leaving a small itchy sting behind on your family members and pets. Incorporating garlic and vinegar into your diet will keep the elements in your blood stream, and flies will not be attracted to the bitter taste or mild smell that is emitted from your skin. A few drops of vinegar or garlic oil can be added to your pet's water supply, or you can make a homemade spray safe for your family and pets. Mix about 2 cups water with 1/4 cup of either vinegar or garlic oil and spray onto pets and family members.